I’ve been working on a wedding gift all this week. It’s for a dear friend’s daughter. I tried some new things out on this art piece. I was inspired by another artist I admire who is a bookbinder – she does amazing things with paper. 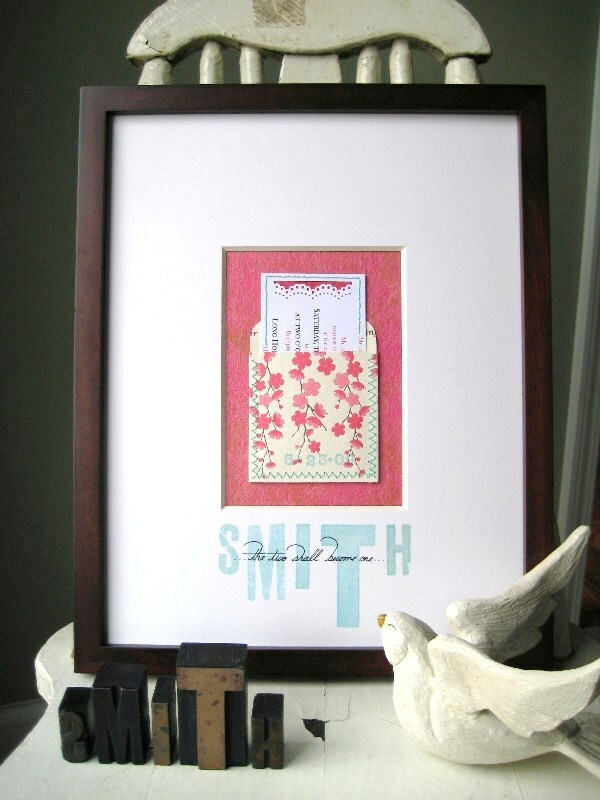 For this wedding gift I used the brides’ invitations for the focus of the art piece. I made a library card pocket out of her shower invitation and I made the “library card” out of her wedding invitation – both are usally things a bride saves because they are special, so I thought I would use them in a way she could always display and be reminded of that day. I added some texture by doing some hand sewing on both pieces. I also got brave and used my vintage hand-carved letterpress letters (you can see the beautiful wooden letters in the picture) to stamp their name onto the mat and then I wrote one of my favorite marriage scriptures across their name. I am really pleased with how it turned out and will be trying this again. Speaking of weddings, Grady and I celebrated 11 years of marriage this weekend! Praise the Lord!!! How special this gift is for the newlyweds! These are the gifts you cherish and they become heirlooms (around our house we call them “Harrislooms);0)…either way it is a very thoughtful gift , beautifully done my friend. Thank you Susan! I love the “Harrislooms”! Hope you’re doing good – I haven’t seen you in a while. What a beautiful idea!!! You are soooooo talented! More importantly — congratulations on you anniversary!! What a beautiful couple God created when you put the two of you together!! Mrs. Lemarbre, thank you SO much – too sweet! Love this idea! It turned out awesome! Thank you Erin – for the comment AND the idea! Sandi, I can’t begin to tell you how much your gift meant to Elizabeth and Chris. I wasn’t surprised by Elizabeth’s response – her love language is gifts, and nothing means more to her than a gift with a deep personal investment. She was absolutely thrilled. But Chris – he blew me away. Gifts are bottom of the list for love language. But for this one, he was as deeply moved as I have ever seen him. He absolutely could not stop talking about it. It was the only gift he took back with him to Denver. Sandi, thank you so much for blessing my daughter and our new son. We love you and Grady dearly! Kelly, I’m so glad they were blessed by it! That’s one of the things I love most about this gift God has given me – blessing others. Grady and I love you guys too – yall mean the world to us!!! Corinne, thank you for stopping by and for the VERY kind comments! Hope you found some inspiration and that your heart was stirred for our great Lord! Corinne, I forgot to mention that I got my letter press blocks at the flea market but I think you could find some on etsy.